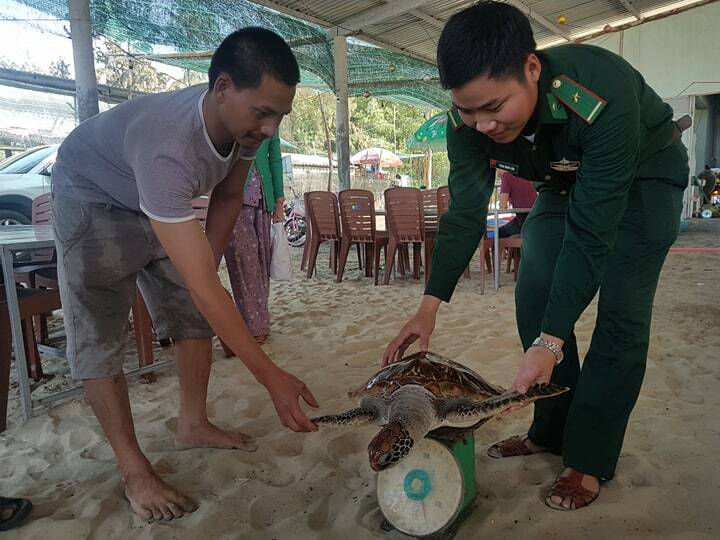 At 3 p.m. on April 1, Chan May Port Border Guard Station in coordination with Loc Vinh Commune People's Committee (Phu Loc district) released a rare and precious turtle into the sea. The sea turtle is 1 meter long, and weighs about 14 kilograms. 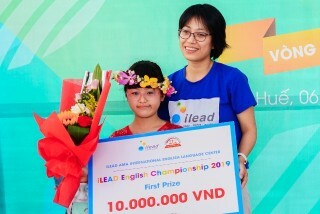 Earlier, at 11 p.m. on March 31, Mr. Phan Thanh Giang, a fisherman in Canh Duong hamlet, discovered the turtle drifted into the rock at Manh Anh cape in Loc Vinh commune, when he was spreading out the net in Chan May bay area. The turtle was in weak health condition at that time. Mr. Giang brought the turtle to a seafood trading establishment so as to let it breathe oxygen, and then reported the case to functional agencies. According to Mr. 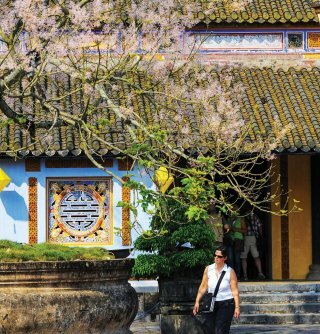 Le Cong Cu, an elderly fisherman in the locality, turtles often come to give birth on the beach in this season, when they return into the sea, they might be weak and stuck in the rock, so that the turtles cannot move. Mr. Nguyen Xuan Bao, Vice Chairman of Loc Vinh Commune People's Committee said: “When we received the news from the locals, we went to the scene and coordinated with Chan May Port Border Guard Station to consider and decide to release the turtle into the sea when its health was stable. 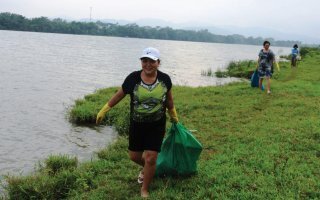 The local government regularly propagates the promotion to protecting precious and rare marine species, so that the locals’ awareness in this issue is increasingly improved”. The sea turtle is identified as an individual from the family of Olive Ridley sea turtle, with the scientific name of Chelonia mydas. The Olive Ridley turtle is a precious sea turtle in the Red Book of Vietnam, which is at EN level and requiring preservation. 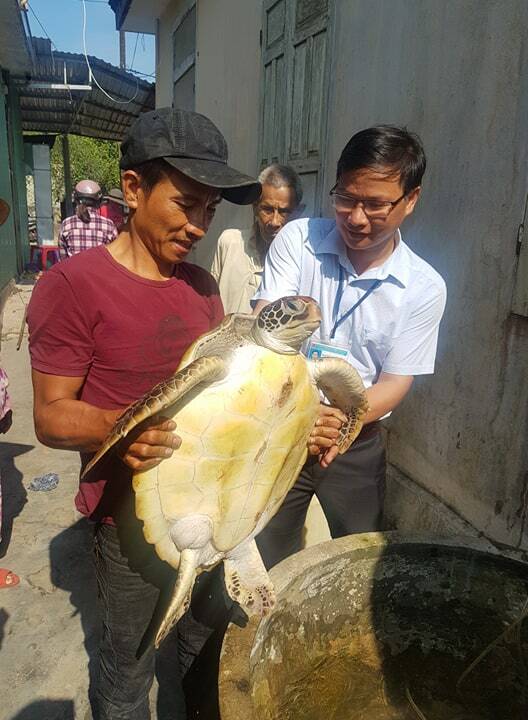 Earlier, on March 26, Mr. Huynh Ngoc Ngu in Phu Cuong hamlet, Loc Thuy commune (Phu Loc district) discovered a turtle in his family’s aquaculture pond. This 18-kilogram turtle was in good health condition, and released into the sea right after that by the functional agencies.